Protect your home or business in Hallandale with Precast Concrete Scuppers that are designed to protect your foundation and landscaping by providing diversion of rainwater away from the building. Precast concrete mimics the aging process of natural stone, providing strength and security for years to come. Atlantic Coast Precast, one of the top providers in our area, offers precast concrete products in a variety of styles to suit you needs. 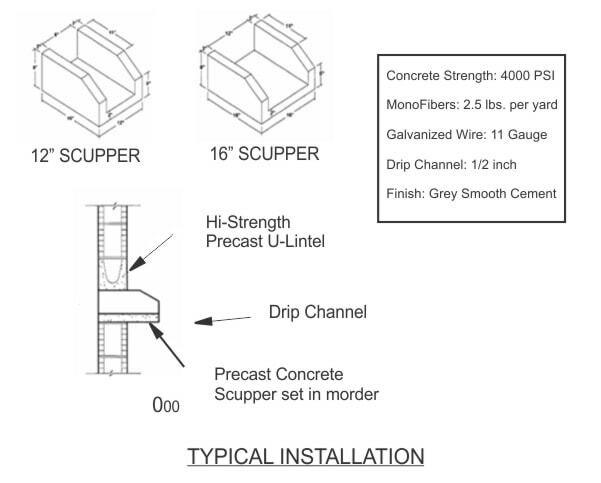 When installed on projects in Hallandale, precast concrete scuppers can prevent rainwater damages to your foundation and landscaping that can prove costly to repair. Working closely with contractors, designers, architects, and engineers, we have decades of experience casting a variety of shapes, designs, and sizes. Also referred to as downspout splash guards or splash blocks, these precast products are a cost effective method of long lasting rainwater management. Choose from one of our large or small blocks or our team can customize a scupper for your project. The process begins with a cast of your design, which can be altered to allow the size of your scupper to adapt to changes in the building design. An investment in adding scuppers can help to protect your building from costly repairs later. Our staff is ready to assist you with any questions that you may have regarding Hallandale Precast Concrete Scuppers.